Konstantin Sheremetev is Grand Doctor of Philosophy in Psychology, scientist, Candidate of Technical Sciences, businessman. He has been engaged in research of intellect for over 20 years. The author of “The Perfect Brain: How to Rule Your Subconsciousness” and “100 Secrets of Happy Love”. He spoke on the Russian TV-channel “Rossiya” and appeared on the radio “Mayak” as a guest expert. Do you want to live a successful and happy life? Do you want to solve any problem and handle any predicament with dignity? Do you want to hover above your life instead of rushing about between stone walls? If your answer is yes, then I have very pleasant news for you. Nature granted you such an opportunity. It gave you intellect which is the most important tool to attain any goal. You only have to do one thing to change your life for the better; you have to start thinking differently. While reading the mini-book you will learn how to turn intellect on at the right time and by doing so solve any problem. To increase your intellect and become smarter is easy; you can understand how it works by reading the mini-book “All About Your Intellect”. More than 40000 people have already downloaded the mini-book and made sure that the method of intellectual development does work. Enter your name and email and get your copy of the mini-book. Privacy of your data is guaranteed! Your email address will never and under no circumstances be delivered to any third party! 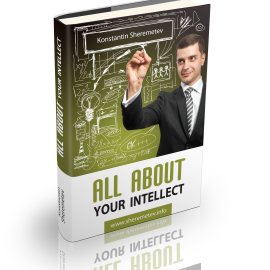 What will you learn from “All About Your Intellect” mini-book? How does intellect affect your life? How are intellect and health connected? How does one actually think? How to become a genius in any area? The mini-book is spread in universal PDF format that is suitable for printing, so you can print the mini-book and read anywhere you like. Join in our mailing list right now to receive the mini-book today. If materials we send will not satisfy you, you can always easily leave the mailing list; you can do that by clicking a link contained in every letter. In that case you can naturally keep the mini-book. Grand Doctor of Psychology, scientist, businessman. P. S. There are a lot of interesting events (free on-line trainings, seminars, edition of new courses on intellectual development) that periodically take place on my web-site; my subscribers are the first to learn about them. Subscribe now!